Hi, @Melinda and @Ngh! Hope your marathon comedown has been bearable. Post-marathon feels pretty good when it's successful like this one. Who's going to identify by sight the model of that car in the playlist pic? 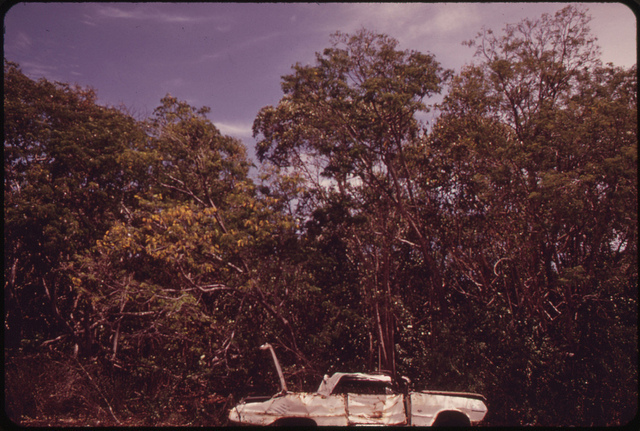 @stillbp, all I can tell you about that car is that it was abandoned in North Key Largo. Perhaps our man Gary Sullivan's the man for the job, @Rev. Hiya, @Mayuko! Happy successful marathon to you. I'm glad we've survived, Sam. Can't wait to go back to doing a normal radio show and playing/listening to music. Popped in to say hi during my last few moments of consciousness. I'm way too tired to unpack this. Russia is no real threat to the US, however, their actions in South Ossetia, Abkazia, Crimea, and eastern Ukraine is enough to give NATO time to pause and think about Russia's ambitions in eastern Europe. Really, I can only see Transnistria as potential move by Russia, except Russia doesn't seem to be interested, even as they have been begging Russia for years to intervene. @ngh, that's a good summation of where I'm at. I do think its important when new narratives come to the forefront of American popular discourse, to think about who that narrative might benefit, and whether similar narratives have captured the public's attention in the past. The analog I am trying to draw is to Team B in the late '70s and their erroneous and misleading analysis that the U.S. government had underestimated Soviet military power. We're having a similar moment of narrative-shifting re-evaluation of Soviet power/intentions, and I wonder what that might mean. The Reaganite narrative is that although they knew the USSR wasn't an existential threat, the US's actions hastened the Soviet Union's demise by making spend more money then they had. The U.S. did know that the Soviets were essentially broke. Sam Segal, horsing around as usual. But was that the story the government was telling the public? Oh, @Doug, I am ashamed. I've turned this perfectly innocent Drummer stream chat board into a forum for political horse play! @Sam: No, not in the late 70s-80s. It really only came out i the mid-90s when it was all said and done. @ngh: Right, so I guess I am just wondering if we might be hearing a similarly exaggerated narrative of Putin's supposed "Hybrid War" capabilities now. No doubt he is a very real threat to Eastern European nations, though. Frankly, I believe everything the intelligence community has said about Russia's hacking here and throughout Western Europe. The question for me is what the government will try to justify doing, now that the Russians are becoming a global threat again, in popular American consciousness. Who will be this era's Mujahideen? And outspending Russia didn't begin with Reagan, though he reaped the benefits. Then again, I am being silly, because clearly the Russian's have something on Trump that prevents him from opposing them. If he had the ability to play into a simplistic narrative of a rising Russian enemy, he'd probably take it in a second. Something's keeping him from doing that. There's nothing sophisticated about Russia's hacking capabilities. It's no more complex then a few dozen 4chan'ers going amuck for lultzes. However, they do have a vested interest to disrupt the Western hegemonic narrative of democracy, EU, and NATO being sacrosanct markers of an advanced 'European geopolitical culture'. So, they throw a few monkey wrenches in the system, and laugh at the chaos (just like 4chan'ers) as the Western Europeans' confidence in the EU and NATO erode (see Hungary, and now Serbia's recent reticence in joining the EU). Oh, the lulz. This is what we've been reduced to. A world run by chan boys. Lord help us. To an outside observer, if Trump had sentience, then it would appear this whole insane narrative is nothing but for the lultz. Actually, that would be more comforting then the current reality. About two hours ago, I was getting ready to watch-stream some documentary, but the music here is so good I never started it. like this [several cuts]. i can't help my fingers tapping. @stillbp, I am honored we could keep you around! Sam has got a pretty fine horseumentary going here. We wouldn't saddle for less. Whoa! Looks like somebody managed to stirrup the conversation here! I had no choice, @Dean. Today's hearing was weighing on my mind, and I thought, hey what's a vanity project like this show for if not to spout off ill-conceived thoughts about an issue I barely understand. I find the Russian hacking scandal very interesting but haven't kept up with the latest due to marathon excitement. I'm waiting for a "there" to be found there. American "intelligence"--excuse me while I chuckle and guffaw at the catachresis--is a shambles. This Sarah Louise is lovely. Do you know Tony McManus? No I do not, @Dean. Anything like this Sarah Louise? Cheers, @ngh! Thanks for talking about Russia with me! Thanks for hanging out, @coelacanth! More traditional Celtic, but he's a monster 6- and 12-string player. He stretches out, covers Monk and such, wanders to Nova Scotia. His "Makers Mark" record is a survey of guitars as well as music. Awesome, @Dean. I'll have a look. Great show -- and thanks, too, for literally handing me the theme for my own for next week (Nuggets)!